An extremely competitive ACC-Big Ten Challenge, one in which six games have already been decided by four points or fewer, comes to a close tonight. Locked at 4-4 going into tonight’s games, let’s take a look at what’s in store for this evening. #20 Syracuse (3-2) at #23 Ohio State (6-0). On the strength of two true road wins against top 40 teams, Ohio State was the top-rated team in the initial NET ratings that were released on Monday. 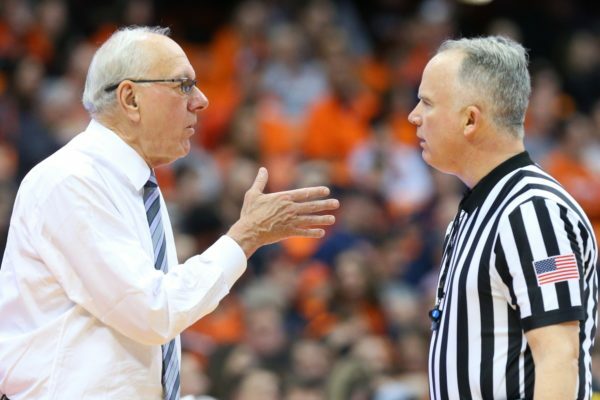 The talented Orange have been disappointing in the early going, as Syracuse visits Columbus tonight with losses to Connecticut and Oregon weighing down its non-conference slate. Jim Boeheim‘s vaunted zone ranks as the nation’s sixth most efficient defense, but poor shooting has carried over to the tune of a 31.4 percent clip from beyond the arc. Oshae Brissett, the team’s best prospect, and Tyus Battle, the team’s leading returning scorer, are shooting 18.2 percent and 28.6 percent, respectively from deep. Point guard Frank Howard’s return to action will certainly provide a boost, but Syracuse will undoubtedly need to be a lot crisper on the offensive end to slow down a versatile set of Buckeyes. #115 Rutgers (4-1) at #22 Miami (5-1). Despite its most talented player, Dewan Hernandez, being withheld from competition amid a review of eligibility, the Hurricanes have been impressive in winning five of their first six games. Diminutive spark plug point guard Chris Lykes leads five Hurricanes averaging more than 11 points per contest, while Dejan Vasiljevic is making 52.5 percent of his threes, good for 77th in the country. Steve Pikiell’s Scarlet Knights have been stingy on the defensive end this season, turning teams over on 24.3 percent of their possessions. However, Rutgers has been especially brutal on the other end of the floor, checking in as the 263rd most efficient offense while turning the ball over at an alarming 22.6 percent rate (312th nationally). Chris Collins spoke openly and often about leaving last season in the past. He, along with his team, wanted to move on. They talked about higher aspirations. If you believe those around the country, the ones that by and large picked Northwestern to finish as high as third in a deep Big Ten, those aspirations should include a second-weekend appearance in the NCAA Tournament. Yet in Northwestern’s first realistic test of the 2017-18 season, it looked a lot more like a team happy with its first career NCAA Tournament appearance last March than anything else. And if its 92-88 home defeat to Creighton on Wednesday night is any indication, there’s much work to be done. There’s a noted difference between teams that make the NCAA Tournament and the ones that progress in it. You can find that stark contrast in many spots from last night’s game. What does Northwestern want to be? You could start by looking at bench points because it told the story of the evening — 33 for Creighton and four for Northwestern. Collins lamented about his shortened bench, and he has a point. The departure of forward Sanjay Lumpkin from last season has been a big blow. It has so far loomed larger than once thought, given that his partial replacement in sophomore Aaron Falzon has been slowed by injury. Still, you know what happens to teams that advance in the NCAA Tournament? They have injuries. Players foul out. Others step up and fill voids. The answer usually isn’t four of five starters playing over 25 minutes. It typically can’t be and it wasn’t for Northwestern on Wednesday. With the season just a few days away, Rush the Court’s Big Ten preview will tip off its coverage by posing season-defining key questions for each team. Today we address Wisconsin and Michigan. #4 Northwestern – Can the Wildcats’ offense take another step forward? Here’s what we know about Northwestern heading into 2017-18: it’s experienced, well-coached and should be darn stingy on defense. What we don’t know is whether the Wildcats, fresh off their first NCAA Tournament appearance in program history, can improve enough offensively to become the top-tier Big Ten contender everyone expects them to be. But there is reason to expect an upswing in production. Already one of the least turnover-prone units in the country (16% TO rate), Northwestern welcomes back the Big Ten’s most experienced — and productive — starting backcourt in Bryant McIntosh (14.8 PPG, 5.2 APG) and Scottie Lindsey (14.1 PPG), a pair of preseason all-conference honorees. While neither is a great outside shooter, both players are very effective from inside the arc and at the free throw line (87% FT and 84% FT, respectively). What’s more, 6’8″ forward Aaron Falzon returns this season after missing most of 2016-17 to knee surgery. His three-point shooting ability (35.5% 3FG) alongside Vic Law (12.3 PPG) — the team’s best returning perimeter shooter, defender and overall athlete — should give head coach Chris Collins plenty of depth and versatility at the wing position. Throw in one of the league’s top offensive rebounders in Dererk Pardon (12.1% OReb rate) and you’re suddenly looking at a roster that can stretch the floor, limits miscues, maximizes its opportunities to score, and makes the most of its trips to the free throw line. In other words, you’re looking at all the makings of an efficient offense. After scoring less than a point per possession in eight of their 12 losses a year ago, the Wildcats need to realize that potential this year if they’re to truly compete for a league title. Ultimately, Gonzaga did just enough today in Salt Lake City to survive and advance. A dominant first half bought enough equity for the Zags to withstand a furious and relentless Northwestern comeback attempt that ended with some officiating controversy. Playing less than a 40-minute game is playing with fire. Gonzaga was in total control of this game at halftime, but then came out and had very little second half answer for a Northwestern team that went all-in on trapping its posts and cheating into the passing lanes. In the second 20 minutes, the Bulldogs committed a staggering 11 turnovers and allowed 17 points off those miscues. On the other end of the floor, the Wildcats shot 50 percent from the field in the second half and posted an offensive efficiency of 129.3. 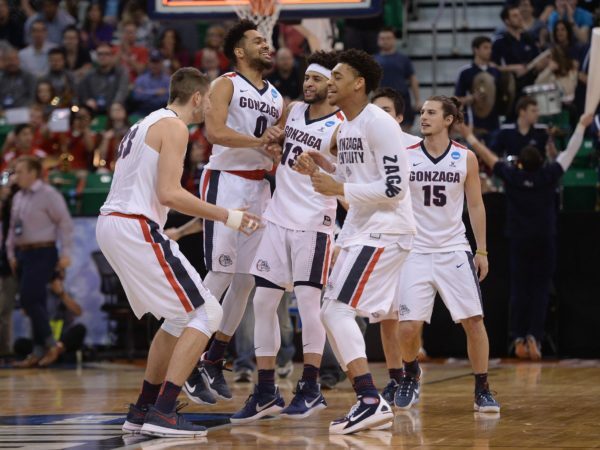 As the competition level increases in coming games, Gonzaga is going to need to bring a lot more if it’s going to be as happy at the end of the NCAA Tournament’s second weekend as it is right now. Gonzaga’s frontcourt isn’t just big, it’s deep. Everyone knows about Przemek Karnowski inside but freshman center Zach Collins carried the Bulldogs in the second half, scoring 12 points on 3-of-3 shooting and 6-of-8 from the line. He regularly absorbed triple-teams and still scored, showing a great touch and an ability to finish off screen-roll dives. He wasn’t alone, however. Fellow freshman Killian Tillie also had a solid eight points, combining for 10 rebounds and five blocks on the afternoon. Officiating needs to improve significantly in the second weekend. In a game that had 150 possessions, it’s a tough case to convincingly make that a single call or play was the difference between winning and losing the game. That said, the blown goaltending combined with the subsequent technical foul on Chris Collins really diminished what was shaping up to be a legendary finish. The officiating from the notorious Pac-12 crew left much to be desired, and blowing that call — if it didn’t decide the game — at least, significantly impacted the game. Northwestern was deprived of an opportunity, and that should never happen simply because of an egregious mistake by the officials. Star of the Game. Nigel Williams-Goss, Gonzaga. The WCC Player of the Year was the best player on the court today, blitzing Northwestern to the tune of 20 points, eight rebounds and four assists in addition to hitting a cold-blooded three to silence Wildcat fans during one of their second half runs. He can score from every spot on the floor; he is an active participant in the rebounding effort; and he’s got plenty of moxie. RTC’s Chris Stone (@cstonehoops) is providing on-site coverage of the Big Ten Tournament in Washington, DC. Is Wisconsin back? All too frequently this season we’ve had to ask ourselves, “Is Duke back?” Maybe it’s time to shift the subject and ask the same thing about the Badgers. Before their home win over Minnesota in the final game of the regular season, the Badgers had lost five of six. They are now on a three-game winning streak with victories over the Gophers, Indiana and Northwestern. Wisconsin’s defense against the Wildcats today was smothering, holding them to a measly 0.76 points per possession. The Badgers also seemed to find a groove offensively. They made 12-of-29 three-pointers en route to 76 total points. Wisconsin’s late season losing streak likely pushed it several spots down the seed ladder, but when the Badgers are playing like this, they are a very dangerous opponent. 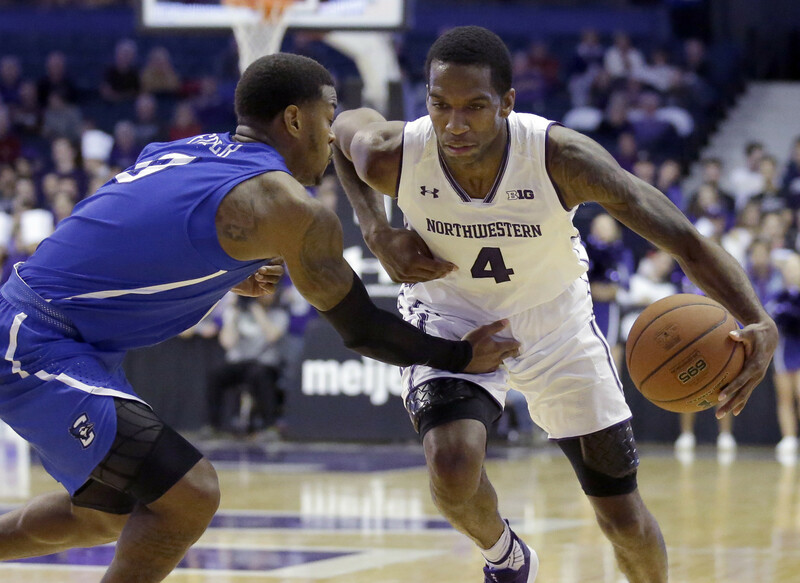 Northwestern’s offense is its biggest March limitation. There’s no doubt that Wisconsin’s defense played a role in this, but the Wildcats’ offensive weaknesses were on display Saturday as it delivered its worst performance of the season — the fifth time this year (all losses) that they had scored below 0.90 points per possession. Northwestern’s most valuable offensive pieces are inefficient scorers, with Bryant McIntosh, Vic Law and Scottie Lindsay all logging effective field goal percentages under 51.0 percent. This doesn’t necessarily mean that the Wildcats are doomed to a short stay in their first NCAA Tournament ever, but if they want to win a game next week, they’ll need more out of their offense or a significantly better defensive outing to get the job done. Wisconsin won the hustle stats and that mattered. 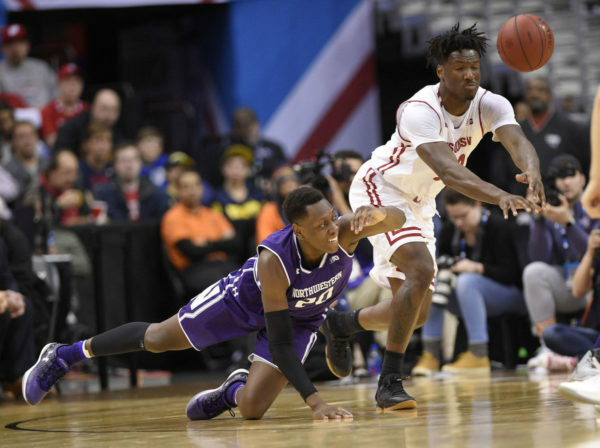 Both Northwestern head coach Chris Collins and McIntosh mentioned the Badgers’ work on the offensive boards and getting to loose balls as a turning point in Saturday’s game. “I thought those were the areas where they were able to stretch out their lead,” Collins said. Wisconsin grabbed 12 offensive boards, and while the box score doesn’t keep track of loose balls, it was often the Badgers who seemed to come up with them. Star of the Game: Nigel Hayes, Wisconsin. Hayes finished with 18 points and 10 rebounds, his fifth double-double of the season. Most importantly, he was a very efficient player today on the offensive end of the floor. Hayes shot 7-of-11 from the field and made a pair of three-pointers. The standings in the Big Ten continue to be a jumbled mess, with 10 teams within two games of the top spot. 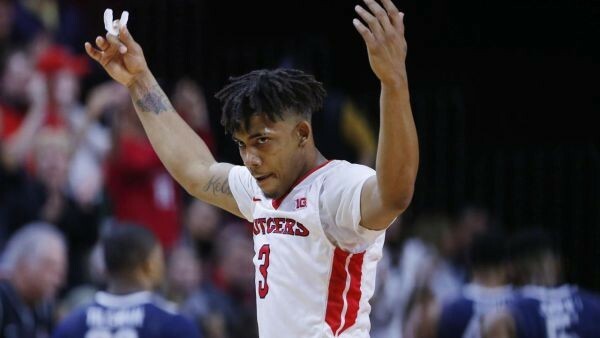 All but Rutgers has won a conference game, and aside from Wisconsin, is there another Final Four contender among the bunch? Here’s the best and worst of the last week of Big Ten action. Player of the Week: Ohio State’sJaquan Lyle had one of the most efficient outings of his career as the Buckeyes picked up their most significant win off the season over Michigan State. Lyle used his size to bully Sparty’s point guard tandem of Cassius Winston and Tum Tum Nairn, but his primary contributions to the victory were twofold: 5-of-7 shooting from three-point range and six assists along with only one turnover. Lyle, who was shooting a poor 28.2 percent on the season from deep just three games ago, has improved to 36.4 percent after making nine of his last 14 attempts. The sophomore has had a maddening tendency to make a couple head-scratching mistakes per game, but if he is finally becoming one of the best point guards in the league, Ohio State should be in good position to turn things around after a slow Big Ten start. Northwestern is now 9-2 after holding on for dear life to defeat Dayton in the State Farm Legends Classic on Saturday night. As the Wildcats progress through the rest of the season, the chatter about whether they can string together enough wins to break their infinite NCAA Tournament drought will pick up accordingly. 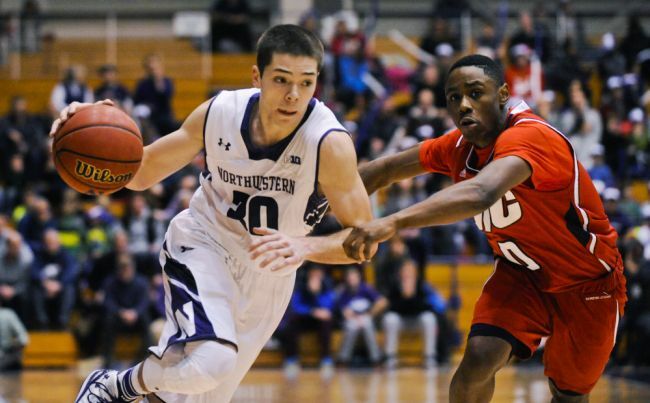 A quick review of Northwestern’s season so far reveals that star point guard Bryant McIntosh has struggled to match his production from a year ago. His numbers across the board is down — shooting, assists, scoring — and his turnovers are up. This can be viewed two different ways. The first is that a good team can become that much better if McIntosh returns to his previous levels of output. The second view of it is that the Wildcats are likely to face some problems once league play starts if their junior point guard is in the midst of a season-long swoon. Bryant McIntosh has struggled this season for Northwestern. (AP). McIntosh’s problems start with a prolonged shooting slump through the first 11 games — he is connecting on a miserable 24.4 percent of shots from distance — down from a career mark of 37 percent coming into the season. His shooting woes have bled into other facets of his game, including a higher turnover rate (20.6 percent, up three percent) and lower assist rate (29.3 percent, down eight percent). There have been some better moments against good competition — a 23-point game against Wake Forest and a 20-point outing against Texas — but his production in the team’s two losses of 9.5 PPG with a 1:1 assist-to-turnover ratio has been a problem. The Wildcats’ loss to Notre Dame was especially brutal as the team ran several isolation plays for its lead guard during the final few minutes, but he was unable to deliver a bucket. Is Northwestern Finally Breaking Through? It’s nearly impossible to talk about Northwestern basketball without mentioning its ignominious streak of missing the NCAA Tournament in every year since the event’s inception. While that dishonor receives nowhere near the public interest that north side of Chicago neighbor Cubs’ 107-year World Series drought gets, it’s a similar marker of futility. Wait — what’s that? The Cubs did what this year? Well, I’ll be darned… so can another long Windy City sports dry spell be snapped this year? Early indicators look good. Eight of the 14 Big Ten teams will play in early-season tournaments over the next seven days. The festivities begin this afternoon with Wisconsin in the Maui Invitational, but continue for much of the next week as turkey, dressing and cranberry sauce commingles with basketball in far-flung locales. Here’s the first of a two part-breakdown that discusses what each participating Big Ten team faces this week. Nigel Hayes needs to have a productive stretch of games in Maui for Wisconsin to win the event. (Getty). Capsule: Wisconsin is 2-1 and looking to gain some momentum after losing a road game to Creighton and not playing well in a win over Chicago State. The Badgers’ offense is attempting a robust 29 three-pointers per game, so establishing Ethan Happ in the paint should help. Top 10 teams like Oregon and North Carolina potentially await later in the week if Wisconsin can get past Tennessee. Key Player: Nigel Hayes hasn’t shot the ball well this season (38.7% FG), only scoring three points in 16 minutes of action against Chicago State. The preseason Big Ten Player of the Year needs to start producing for Wisconsin to earn some big wins on the islands. Prediction: Wisconsin will go 2-1 in Maui. They will win their first game against Tennessee; lose to an Oregon squad that expects to have Dillon Brooks back; and then beat either UConn or Oklahoma State on Wednesday. The ballots have been revealed and the results have been tabulated. Unlike another round of voting that took place this week, there isn’t as much shock value in seeing these results. We at the Big Ten microsite have voted and determined how the league will shake out this season. The first of three segments lists our bottom five teams. 14. Rutgers: There’s a new coach and correspondingly new enthusiasm at Rutgers. Eddie Jordan is gone and former Stony Brook head coach Steve Pickiell has taken over. There’s still some talent on this roster, with sophomore lead guard Corey Sanders returning along with Mike Williams on the wing. The Scarlet Knights’ biggest issue is that they need to shoot the ball much better all over the floor, ranking 282nd on three-point percentage and 311th on two-point field goals last season. Things weren’t much better defensively, but they added some size and versatility with graduate transfer CJ Gettys and the return of Deshawn Freeman. Pickiell has a great reputation for development, but this won’t be a quick rebuild in the Garden State. 13. Nebraska: The Cornhuskers actually improved by three wins last season, but the program has still fallen sharply after making the NCAA Tournament in 2014. This team loses a second-team all-conference performer (Shavon Shields) as well as an honorable mention selection (Andrew White, transfer to Syracuse). They will replace some of that talent with Louisville transfer Anton Gill, but the majority of the roster aside from senior Tai Webster is comprised of freshmen and sophomores. Scoring is going to be a question mark for this team, but the defensive side doesn’t look much better (last year’s team dipped from 28th in defense efficiency in 2014-15 to 114th last season). It looks like another long season in Lincoln.